In this free online painting lesson I’ll introduce you to my favorite way of storing and using a thinner for your oil paints. 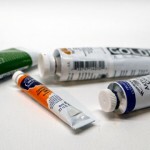 You need a solvent (thinner) for oil painting but most containers you might think to use are not a good choice for use with your painting as they promote waste of the thinner chemical and are possibly dangerous. With some simple items you can find around the house I’ll teach you a great way to store and use your oil painting thinner. It’s also a great way to recycle and maintain a more eco-friendly way of reusing your painting solvent. Have you had a difficult time choosing a thinner for your oil paints? Today we’re going to talk all about your options. All of these thinners I’ll be talking about today can be used to thin out your oil paint and clean your brushes. One of the least expensive options which you’ll find at your regular hardware store is just mineral spirits (OMS). On the shelf next to it is paint thinner. Either one of these options is a low cost way to thin your paints and clean your brushes. A few more dollars will get you pure turpentine; this is the thinner that have been used for hundreds of years for thinning out oil paint. It can leave a sticky residue and it doesn’t dry quite as fast as some of the other options. My favorite oil painting thinner is turpenoid. Turpenoid, while you will not find it at a regular hardware store, you have to buy it at an art store. It’s odorless, it dries quickly, it’s really a great way to thin out you oil paints. What all these thinners have in common is they’re all flammable. So what you are going to need to do is store any paper towels or rags that you’ve soaked with thinner in a fire proof container. I like using this metal can here. I’m John Morfis from helloartsy.com, thanks for watching!